Lee Chong Wei has done it - winning his 12th Malaysia Open title - when he defeated Japan's former world No 2 Kento Momota in straight games in the final at Axiata Arena in Bukit Jalil on Sunday. The 21-17, 23-21 win in the final in the USD700,000 Celcom Axiata Malaysia Open also made Chong Wei richer by USD49,000 as he continues his impressive run in his buildup to the Asian Games in Indonesia in August. The Asian Games gold remains elusive for Chong Wei. His best is a silver medal effort in 2010 in Guangzhou apart from two bronze medals he won in Doha (2006) and in Incheon (2014). At the age of 35, the Penang-born Chong Wei rode on his experience and kept his cool at crucial times to tame the Japanese ace who had gone into the final with a 21-match unbeaten streak. The packed stadium was also a motivating factor for the Malaysian whose family was also there to give him moral support including his wife Datin Wong Mew Choo, a former Malaysian No 1 and his two sons Kingston and Terrance. 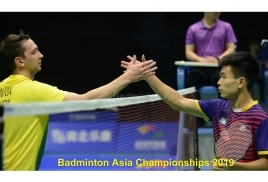 With the win on Sunday, the Malaysian also gained sweet revenge for his defeat 19-21, 14-21 defeat to Momota in the semi-finals in this year's Badminton Asia Championships in Wuhan, China in April. Chong Wei won himself USD49,000 in prize money while Momota took home USD23,400. It was the third meeting between the two players with Chong Wei leading 2-1. Tai Tzu Ying of Chinese Taipei retained her women's singles crown after a hard-fought 22-20, 21-11 win over China's He Bingjiao in the final which lasted 35 minutes. Tzu Ying was also the champion in 2013. For the first time in the history of Superseries, two Japanese pairs met in the final with Takeshi Kamura-Keigo Sonoda prevailing 21-8, 21-10 over compatriots Hiroyuki Endo-Yuta Watanabe for the USD51,800 prize money. The losers took home USD24,800. Japan also won the women's doubles title through Misaki Matsutomo-Ayaka Takahashi with the Olympic champions prevailing 21-12, 21-12 over China's top seeds Chen Qingchen-Jia Yifan 21-12, 21-12. The mixed doubles final was an all-China affair. Fourth seeds Zheng Siwei-Huang Yaqiong clinched an upset 21-19, 21-18 win over second seeds Wang Yilyu-Huang Dongping in the final.